GUWAHATI- India added further gold medals in the men’s compound Archery team. Rajat Chauhan, Abhishek Verma with Assam’s Manash Jyoti Changmai earned India a well deserved gold medal by defeating Bhutan 230 points to 219. Archery competitions which are being played in Shillong, India won the most Gold Medals with 2 in the Individual Category, 2 in the Team Category and 1 in the Mixed Team Category and 2 Silver Medals in the Individual Category, making it a total of 5 Gold and 2 Silver Medals, while Bangladesh bagged a total of 8 Medals – 4 Silver and 4 Bronze Medals in the 2nd Rank, as Bhutan bagged a total of 4 Medals – 2 Bronze and 2 Silver Medals and ranked 3rd Archery competitions, India won gold in the Compound Men’s Individual event. Rajat Chouhan won the gold by defeating Abhishek Verma. 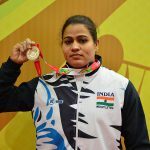 In women’s Compound Individual event Purvasha Sudhir Shende won the gold by defeating Jyoti Surekha Vennam. In both the events close contests were between Indian Archers. 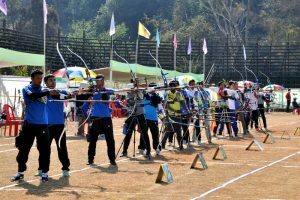 The final tally of the Compound Men Team, India clinched Gold Medal, Silver to Bhutan, while Bangladesh bagged the Bronze. In the Compound Women Team, India defeated Bangladesh and took away the Gold Medal, leaving the latter with Silver Medal.